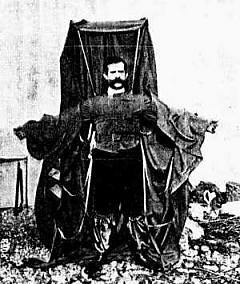 On February 4th 1912 Franz Reichelt attempted to test his latest invention — a parachute jacket — at the Eiffel Tower. He donned his apparatus and tentatively stepped to the edge of the viewing deck. He had multiple primitive video cameras pointed at him to capture this amazing feat. The video shows Reichelt standing on the edge and staring down for a long, long moment. Obviously, he was nervous about what he was about to do, but knew that there was no turning back once he had gone that far. Anyways, what a wonderful publicity stunt it would be! When he leapt off the edge, he plummeted straight to the ground. The jacket was supposed to open up and allow him to float gently to the ground, but it failed to perform as he intended. His parachute jacket turned out to be a failure of an invention. But Reichelt inadvertantly invented something else that day: taking videos of yourself doing something wildly idiotic and hurting yourself in the process. It's something that took a long time to really catch on, but it's safe to say that Franz was truly ahead of his time in this regard.